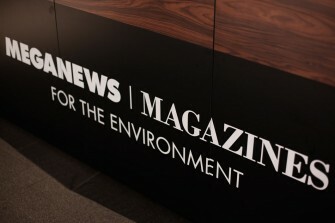 The Swedish research institute Innventia has analyzed the environmental differences between a magazine printed on demand in an automatic Meganews unit, and an equal magazine printed and distributed via the regular newsstand system. In order to get a reliable outcome the analysis was based on an established Life Cycle Analysis (LCA) implying that all the relevant ingredients under the entire lifecycle of the two models were pinpointed from “cradle to grave” – whereas two different scenarios were used. The outcome of the analysis is evident. For both scenarios a 60 per cent reduction of greenhouse gases is attained with the print on demand technology compared to traditional distribution. Most of the difference is explained by the volume paper used in the two alternatives. Print on demand means that every copy printed is sold while traditionally about 40 per cent of the paper volume never reaches the consumer, but is returned for recycling. Innventia concludes that Meganews Magazines should offer Swedish and international publishers an innovative option regarding the distribution of print media – a sustainable alternative. Read the whole LCA analysis here.